The VE-11 portable dual-channel, water-jet aspirator pump, the creates a vacuum using the venturi effect that is dependent on the vapor pressure of water, a function of temperature. Ideal for rotary vacuum evaporators, electrophoresis gel dryers, distillation, vacuum dryers, vacuum filtering units, aspirating corrosive solvents and other common laboratory tasks. 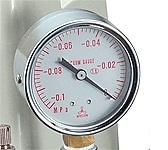 The VE-11 aspirator pump is oil-free and pulseless. It can handle corrosive solvents without the need for cold or chemical traps, without the vulnerability to damage of other vacuum pump technologies. 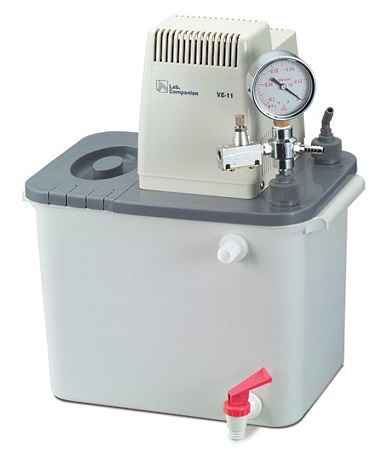 With the recirculating feature the VE-11 Aspirator pump is an economical solution for basic vacuum needs around the laboratory, with initial cost as well as long term operating efficiency.